As we race closer to March and the NCAA Tournament, the NCAA Selection Committee unveiled their current Top 16 seeds in the NCAA Tournament if the season ended today. 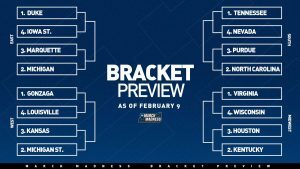 Each region’s top 4 seeds were unveiled on CBS and I am excited as we get closer to the brackets!!!! The local Purdue Boilermakers came in at #9 overall and a #3 seed in the Midwest Region in Louisville. 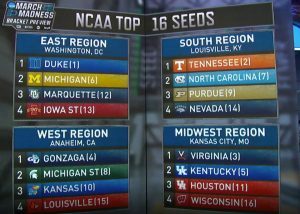 Duke came in at the #1 overall seed followed by SEC leader Tennessee. Crossroads Sports Bracketology correctly picked 14 of the 16 teams unveiled.